What You Need: Flat (“no-roll”) style clothespin, pink acrylic paint, white felt, small white pom pom, two small googly eyes, black marker, scissors, glue. How You Make It: Paint clothespin pink and let dry. Cut thin strips from felt for inside “ears” and glue to long ends of clothespin. Glue on eyes and pom pom nose. Draw on mouth with black marker. You could also glue another pom pom on the back for a rabbit cotton tail! 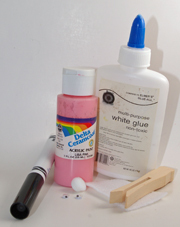 What You Need: egg carton, scissors, tempera paint, paintbrush, glue, 1/8-inch hole punch, black pipe cleaner, googly eyes. 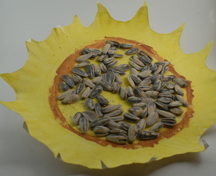 How You Make It: Cut apart egg carton into individual “cups.” Paint bugs however you’d like. Glue on googly eyes. Punch or poke three holes on each side of bug. Cut pipe cleaner into three equal sections and insert one in each set of holes. “We tried it” tip: If you don’t have a small hole punch, a pointy object should work. Pre-punch leg holes for small children. What You Need: wooden clothespin (either style), 2 small googly eyes, pipecleaner, paint, paintbrush, glue. How You Make It: Paint clothespin and let dry. 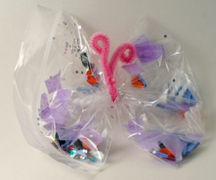 Wrap pipecleaner around clothespin to make “wings.” Glue on googly eyes.